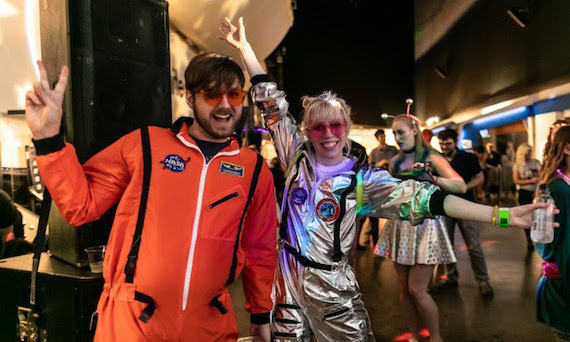 SEATTLE – The annual Yuri’s Night 21+ dance party at The Museum of Flight is April 12, and this year it offers a preview of the new traveling exhibition, Destination Moon: The Apollo 11 Mission, which opens to the general public the following day. Yuri‘s Night celebrates humanity’s past, present, and future in space with music, smarts, tech and the arts. The 6-11 p.m. spectacle in the Museum’s 7-story Great Gallery will offer a cash bar, food trucks and dance music provided by Noise Complaint. General admission is $45 and includes two drinks plus exclusive admission to Destination Moon. Tickets on sale beginning Feb. 5. The Great Gallery will become an intergalactic nightclub with Seattle’s best electronic music DJs taking center stage. An eclectic mix of drinks and food trucks will keep partiers well nourished, while a photo booth, virtual reality experiences, and other space-themed activities will keep everyone in orbit. The spirit of Yuri’s Night will continue in downtown Seattle at the Yuri’s Night After Party @ Noise Complaint. Tickets to the After Party at Kremwerk Timbre Room Complex are $10 when purchased with Yuri’s Night admission, or $20 at the door. Yuri’s Night parties and events are held around the world every April in commemoration of Yuri Gagarin becoming the first human to venture into space on April 12, 1961, and the inaugural launch of the first Space Shuttle on April 12, 1981. This year’s Yuri’s Night at The Museum of Flight also celebrates the first Moon landing with the Destination Moon: The Apollo 11 Mission exhibition, its centerpiece being Apollo 11’s historic command module, Columbia, the iconic spacecraft that brought Neil Armstrong, Buzz Aldrin, and Michael Collins to the Moon and back. Destination Moon opens to the general public on April 13, and will be on view through Sept. 2.